21.00 UTC 127mm Refractor and QHY5v camera. Seeing not brilliant but Jasmine my 5 year old grand daughter was very keen to look through my telescope at Jupiter. As it happened, Ganymede was about to transit the Jovian disc, so after watching the moon get closer and closer to the limb, we decided to photograph the transit. 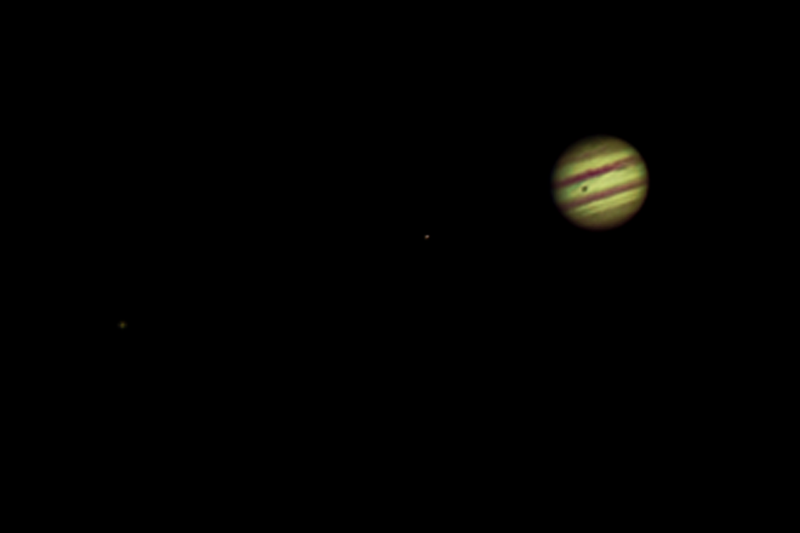 As Jasmine's bedtime had been twice extended we couldn't await the appearance of the Great Red Spot. She was very pleased with the image which I printed for her. She will take it to school next week to show her teacher! I think I might have another amateur stargazer in the family!